SPRAYER DESCRIPTION: Hose end sprayer which features the best on/off system. 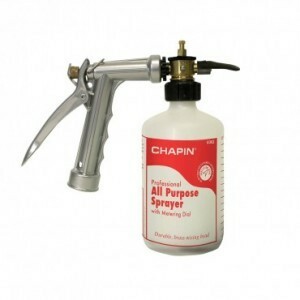 As the picture shows, its designed with the standard water sprayer as a built in component. This means you have complete control over the water flow. Instead of having to manipulate a small "on/off" switch or button, this ergonomic design is one which everyone is familiar with so it's easy to use. It features durable, chemical resistant die cast zinc which is accurately calibrated and precise with it's measurement when mixing chemicals. It has 16 settings with a dial on top that is easy to adjust and easy to understand. The nozzle can be rotated, much like the first three types of hose end sprayers, so it can spray a "deflected" flow down, up or sideways. This same nozzle can be removed so it will flow a straight pin stream if longer reach is needed. It can hold up to 16 oz of liquid pesticide, fungicide, herbicide or fertilizer.